A financial power of attorney lets you grant an agent rights to control your property, money, and business operations. 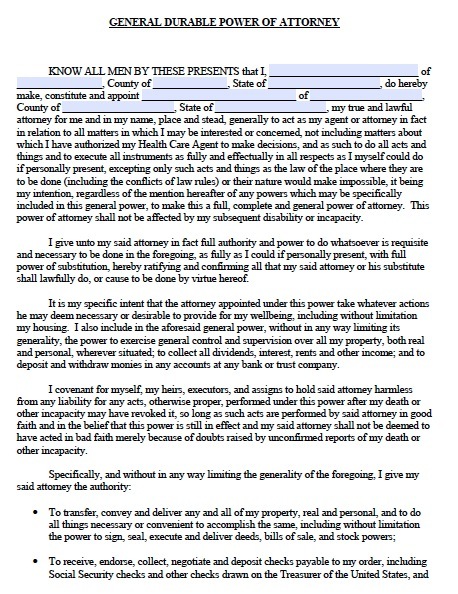 Some lawyers advocate using a power of attorney that grants more specific rights, however, because in Massachusetts, institutions have sometimes failed to honor a document that allowed the agent to do absolutely anything with the principal’s property. In Massachusetts, you can grant the agent broad authority to manage the following subjects on your behalf. You should exercise special care when choosing an agent, and pick only someone you have the utmost trust in. Make sure he or she understands precisely how to manage your finances. In Massachusetts, you must have the document signed by two witnesses.